Who runs the world? Well, more often than not, it’s men. Because of that, we do not always learn about powerful women in history. It’s either inconvenient, controversial or simply overlooked by those in charge of writing curricula — especially if it shifts power away from those in charge. Let’s right that wrong. Here are some of the incredible women that have led revolutions. 1. 20 B.C. 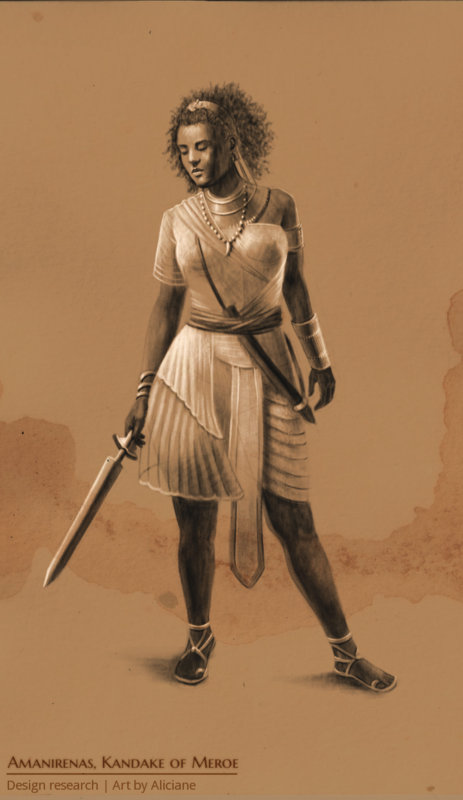 : Queen Amanirenas of the Meroitic Kingdom of Kush, now modern Sudan. She defied Roman invaders and took in people whose lands were occupied. Amanirenas and her son, Akinidad, took the cities of Syrene, Philae and Elephantina, removing Roman statues from their sites as tokens of their victories. Archaeologists found an over-sized head of Augustus, decapitated from a full statue and placed at the bottom steps of the Meroitic temples as a sign of defiance and disdain for Roman invaders. Artwork by Elésiane Huve of AlicianeArt. Used with permission. 2. 9 B.C. : Queen Gwendolen was the legendary queen consort of King Locrinus. He married her for power, but when her father passed away, he divorced her for his German mistress. After seeking safety in Cornwall, she banded together an army. Gwendolen then defeated Locrinus in battle at the River Stour, the division between Cornwall and Loegria. Queen Gwendolen then took control of the Britons and became the first ever queen regnant, who had full control over decision-making, taking the role her father once held. Gwendolen was one of the first British rulers that showed just how powerful a woman can be, proving she could can as well as a man. She reigned peacefully for fifteen years, then passed the throne to her son. 4. 60-61 A.D.: Boudica is a notable figure in Celtic history. That’s rare, considering the Celts left very little written record and much of her story has become legend. Boudica was drawn into battle after the Romans ignored her deceased husband’s will, which would have split his kingdom evenly between his family and the Roman conquerors. Boudica was beaten and flogged while her two daughters were raped, and then the Romans took all that they wished from the Iceni kingdom. Boudica and her daughters united the local warring Celtic tribes and drove the invaders from what is now modern Wales all the way to London, winning several battles against the Romans and creating alliances among the native Celtic and Briton tribes. Emperor Nero almost removed Roman forces entirely because of Boudica’s successful campaign. Sadly, the Romans eventually won and Boudica took her own life to avoid capture. 5. 69-70 A.D.: Veleda was a Germanic seer, prophet and leader. She was seen by her people as a living deity and predicted the success of the rebel Germanic tribes against the Roman invaders. It’s impossible to know whether she purposefully incited her people and the group of rogue Romans to fight or if they were merely inspired on their own to do so after hearing her prophecy of victory. Regardless, her people experienced a brief respite from Roman rule as a result. Veleda, by Charles Voillemot. Circa 1869. Wikicommons. 6. 225 A.D.: Lady Triệu, also known as Triệu Thị Trinh, protected Vietnam from Chinese invaders of the Eastern Wu. She is quoted as saying, “I’d like to ride storms, kill sharks in the open sea, drive out the aggressors, reconquer the country, undo the ties of serfdom, and never bend my back to be the concubine of whatever man.” Orphaned and raised by her brother, Trieu gathered 1,000 followers at the age of 20 and led them against the Chinese invaders. She rode an elephant into battle and named herself Nhụy Kiều Tướng quân (The Lady General clad in Golden Robe). She eventually lost and committed suicide rather than be captured by her enemies. 7. 270 A.D.: Zenobia, the Syrian queen, revolted against the Romans. Zenobia became ruler of the Palmyrene Empire after the death of her husband. Within two years of her rule, Zenobia expanded the empire to include a conquered Egypt, while Roman forces were ejected from the area. She physically led her forces, showing that she was a strong horserider and able to walk for several miles on foot. Zenobia became known as the “warrior queen” after taking the head of the man that tried to eject her from the country she claimed to have descended from. Egypt remained under Zenobia’s rule for two years before she was taken by the Romans. Queen Zenobia’s Last Look Upon Palmyra, by Herbert Schmalz. 8. 375 A.D.: Mavia, Queen of the “Saracens,” inhabited southern Palestine and northern Sinai. Mavia was a Syrian warrior-queen who also revolted against Romans. Her Arabic name was Mawiyya. She was married to al-Hawari, who also led their people the Saracens/Tanukhids, a loose confederacy of Arabic tribes that moved northward from modern-day Iran. Mavia’s people had over a century of experience with Roman battle tactics after fighting as Roman troops under Roman rule. Mavia led the battles herself, captaining her victorious troops against the Roman hoardes. 9. 1136 A.D.: Gwenllian ferch Gruffydd led a Welsh revolt against invading Normans, who were in control of southern England at the time. Gwenllian and her husband were forced out of their home and into hiding by the southern invaders, but retaliated with their “lightning raids,” which fended them off for quite some time. Eventually, Gwenllian and her family were slaughtered by the Normans, but inspired the Welsh to rise up and overthrow the Norman invaders. Welshman often would shout “Revenge for Gwenllian!” as they rode into battle. There are so many women who have been pivotal in fighting for justice and freedom, it’s hard to include them in one article. Stay tuned for two more installments celebrating history’s brave and unrecognized women.